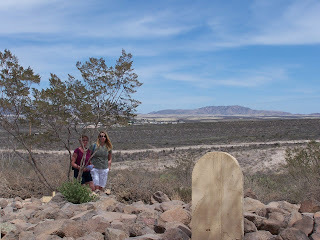 Boot Hill in Tombstone is one of those places you gotta see at least once, even though it is very small. If you didn't want to linger, you could probably walk through the area within 5 minutes. 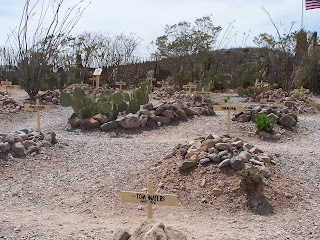 It is well tended with a quiet somber atmosphere, even with a multitude of tourists strolling the ground with their cameras--it is the final resting place for several larger than life people after all. 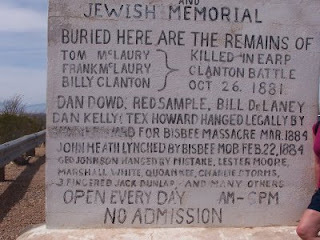 The graves are similarly marked with painted white wooden gravemarkers and black lettering, obviously not the orginal markers, which was a little disapointing. 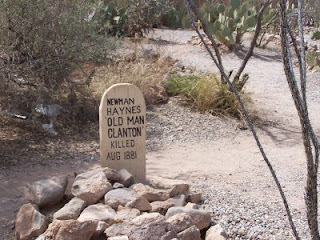 Most of the graves are piled high with stones, a few with gates around them. 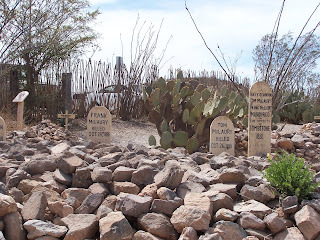 There are no brilliantly colored flowers, just the scrub brush and small cacti that are natural to the dusty desert region. 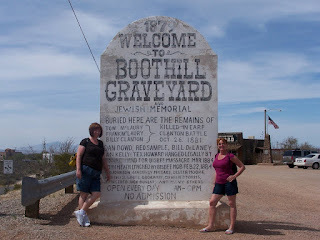 Boot Hill really is a hill at the far edge of town, not a towering one but more of a sloping rise that has a great view of the plain beyond. In fact all the feet were planted facing the direction of the best view on the downward slope. very cool! - Is that Mom or Bekie? j/k! so glad they clear Geo's name by saying he was "hanged by mistake"
Sounds like just my kinda place. Ancient grounds and nobody to talk back! Love the pics.